BANGKOK, Thailand May 27, 2013: Today, in launching its third annual Global Destination Cities Index, MasterCard announced that Bangkok is this year’s number one city for travel. While London reached the top spot in 2012, it was edged by the slimmest of margins with only about 25,000 visitors separating the two – a difference of about one percent. The study looked at the highest international visitor numbers in 2013, with London, Paris, Singapore, and New York rounding out the top five. The rise of the Asia/Pacific region is reflected in this year’s index. 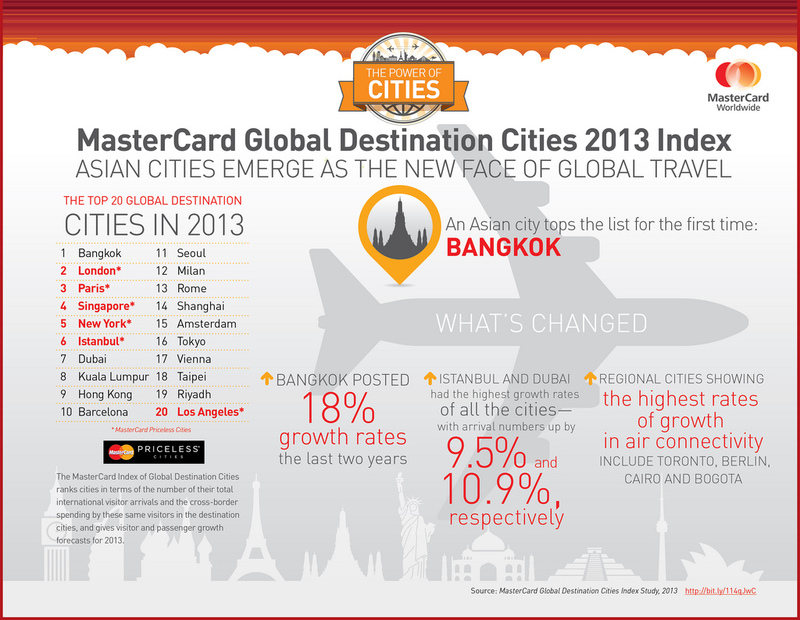 Bangkok is the top ranked city in Asia which has the largest number of Destination Cities this year at 42. Of the 12 destination cities showing the fastest increase in air travel connectivity, all are located east and south of Istanbul. Also notable is Tokyo which has shown a strong recovery in 2012, bouncing back to 20 percent from a severe contraction of 20 percent in 2011 as a result of the earthquake, tsunami and Fukushima nuclear disasters. Tokyo is also gaining momentum in regional cross-border spending, moving up from seventh in arrivals in region to the third rank in spending. Two Australian cities, Sydney and Melbourne, appear in the top 10 in spending – ranking fifth and 10th, respectively. These trends are a reflection of the higher costs of living in these two cities as well as the tendency to stay longer when travelers visit these two cities. London continues to rank first in Europe in international visitor arrivals, followed by Paris, Istanbul, Barcelona, and Milan. Istanbul’s growth rates were such that it could well surpass Paris in 2016. The fastest growing city in Western Europe in air travel connectivity is Berlin, which ranks 17. Led by Mexico City, the lineup of the top 10 destination cities in Latin America remains unchanged. But this apparent stability masks rapidly changing growth dynamics when looking at the top five destination cities. Lima is gaining traction as the fastest-growing city, followed by Sao Paulo. If this growth trend continues, Sao Paulo could surpass Mexico City and Buenos Aires in 2017, and Lima could overtake Buenos Aires in 2018. If Istanbul is on the rise in Europe, its counterpart in the Middle East and Africa is Dubai which retains its number one rank in the region by a large margin. In North America, New York retains its top ranked destination city in the region, followed by Los Angeles and Miami. Toronto comes in fourth overall and is trending up as the fastest-growing air travel connectivity in North America.